Planning a large event can be very challenging and time-consuming; thankfully your social media efforts don’t have to be. HootSuite is the perfect time-saving social media tool for event planning, bringing all of your conversations into one manageable space. The organizers of TEDx Stanley Park in Vancouver, British Columbia, took on the challenge of building a major educational event from scratch. As volunteers, all of the organizers had jobs who couldn’t spend all day on social media. HootSuite allowed them to schedule posts in advance, and saved them valuable time that they used to create a well-organized and thought-provoking experience for their attendees. It also became a customer support hub, a central place where they were able to monitor conversations and answer questions about tickets or provide other event information. TEDx Stanley Park used social media to give their event it’s own unique character. With so many concerts, fundraisers, parties and events out there, it can sometimes be difficult to distinguish your event from the pack. Social media provided organizers with the opportunity to build their own unique brand. They set out to embody the motto “Think the Unthinkable,” in their event and on social channels. In doing so they were able to attract and engage an audience online, one that also attended in person on the big day. 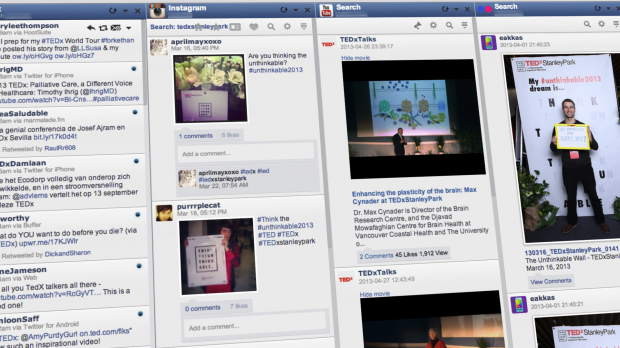 HootSuite is a one-stop shop for the social media management of your event. Sign up for a free HootSuite Pro trial today. All TEDx organizers can sign up now for a Free 3-Month HootSuite Pro Subscription, with the possibility of a 1-year extension. Find out more here.